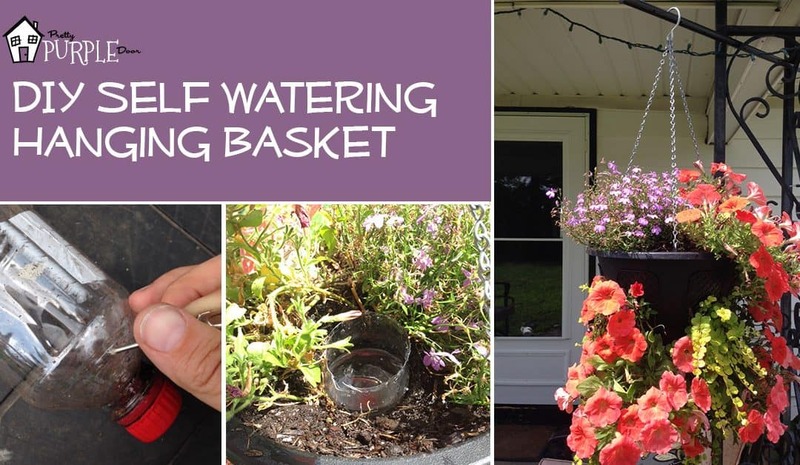 Here’s a super easy way to make a DIY self-watering hanging basket or self watering planter without spending any money. Hanging baskets tend to dry out in the air.There’s constant watering and upkeep involved. And… if you go on vacation or let it slip for a few days you’re rewarded with dead plants. 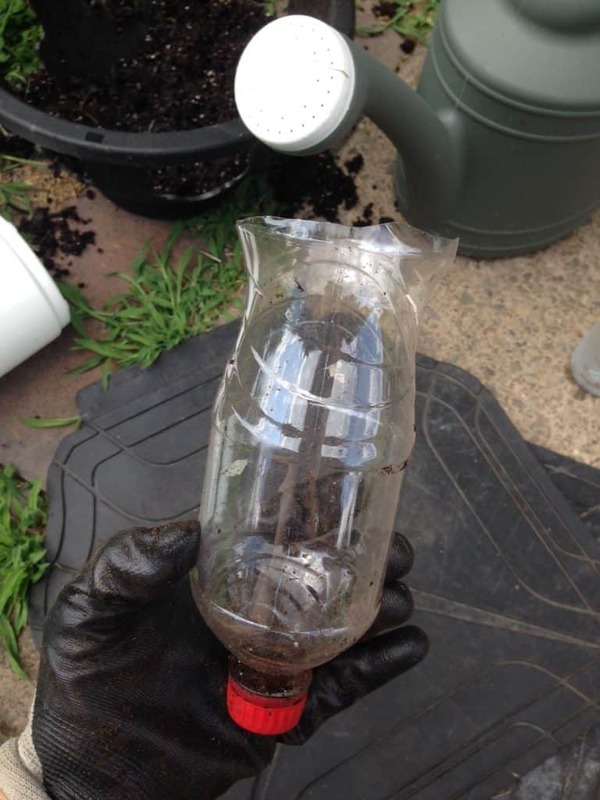 Using a free 20 ounce soda bottle to DIY your self watering hanging basket is a great solution! I use this on all my hanging baskets… and believe me, it works! Don’t waste your money on a self-watering planter or basket. Instead, take an empty (sturdy) water or soda bottle and cut the bottom off of it with scissors. Next, use a compass (or sharp object) to poke some small holes. Poke the holes near the cap of the bottle. This will be near the bottom of your planter when assembled. And, the bottom is where your plant roots are. The hole size doesn’t matter too much. Just make the holes aren’t too large so that the dirt doesn’t clog it up . You also don’t want the water to immediately POUR out and soak your roots. Put one hole as low as possible (near the cap) to drain the water completely out of the bottle. I put about 10-15 holes in my bottle. More holes the closer you get to the cap. 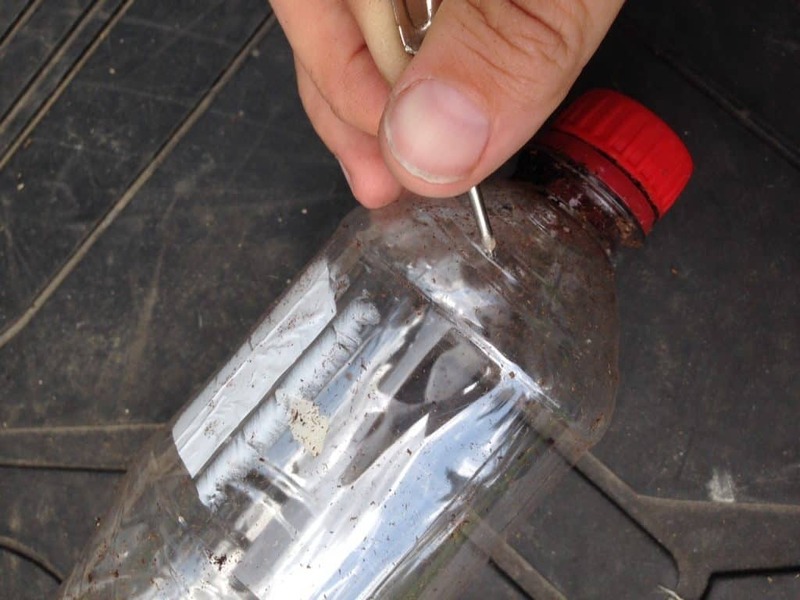 Now, put the bottle cap down in your planter. Then, fill the hanging basket around your bottle with potting soil. 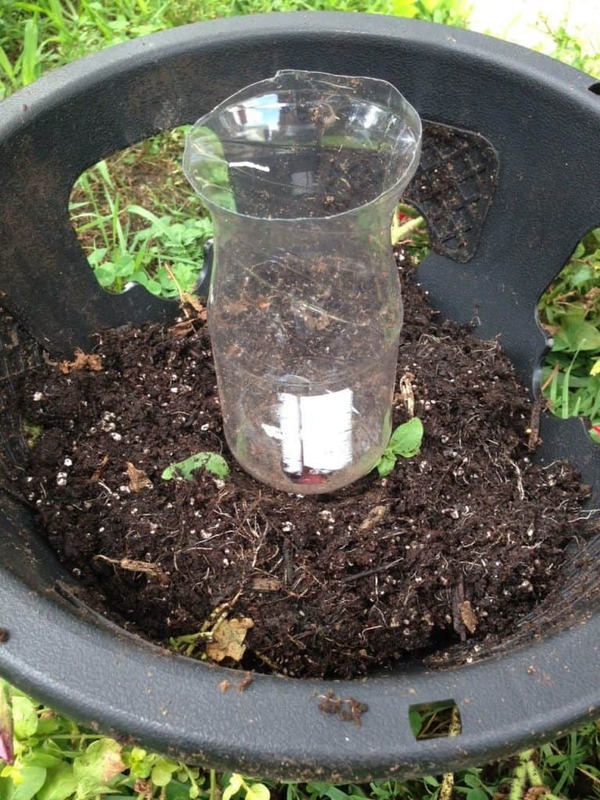 When filled, about 1-2″ of the bottle should stick out above your soil. You need to be able to access the top of the plastic bottle to fill it. But, you don’t want it to be too high that you can’t hide it. Use your flowers and plants to disguise it. Once your bottle is situated, you can plant your followers. Top off your new self-watering hanging basket with soil. .Just make sure that you don’t cover the top of your bottle! PS: If you like cheap and cool DIY garden projects, you’re going to LOVE the purple planter I made out of an old drawer from the dumpster! Here’s the hanging basket just about finished. You can see that I still have some room to cover this up. If you don’t like the way it looks you can certainly add more dirt or trim the bottle so that you don’t see as much of the plastic. I plan to add another flower in front of the water reservoir so that the the flowers will surround the bottle. You won’t even see the bottle when it’s done! How often do I need to fill the bottle with water? Every week or so, fill your soda/water bottle with water. 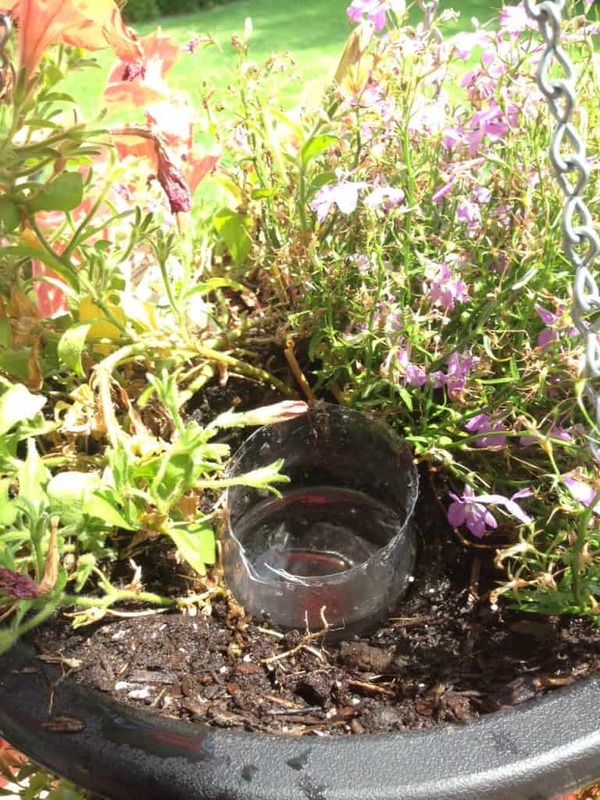 The water should slowly drain out of the holes you made and keep your plants healthy. Instead of watering my hanging baskets every single day, I’ve found I can get away with nearly once a week. When it’s really hot and humid it may need more water. But overall it’s a great and FREE solution to the frequent watering needs that hanging baskets require. 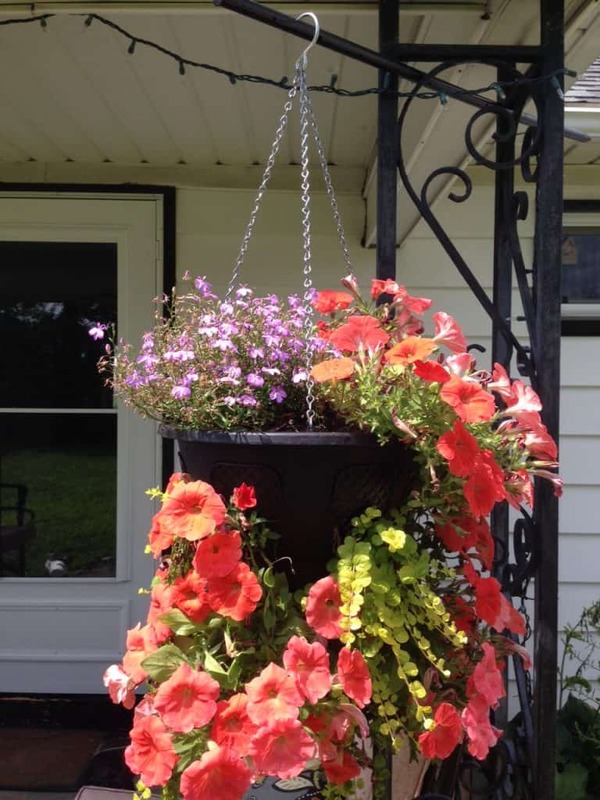 I used coral-colored petunias, lobelia (purple) and creeping jenny as the green trailing plant. Creeping jenny is the green trailing plant is actually a perennial groundcover that spreads really nicely. I like having it in the garden because it keeps the weeds out. Added bonus is that it also makes a great spiller plant for hanging baskets or planters. Because it’s a quick spreader, when you dig some up from your garden, it fills back in quickly. Another plant combination you could try is pansies or impatiens (or really any flower), sedum (I like autumn joy) and vinca minor which is a purple groundcover that looks similar to the lobelia. Remember when you are planting a basket or pot to try to find three types of plants with contrasting form and texture. This creates a thrill, fill and spill effect that will make your basket look awesome. Most of all… get creative. There are no hard-fast rules about planting your hanging baskets. Make them as simple or as over-the-top as you’d like. And, since they are self-watering you don’t have to stress over the everyday watering regiment! How long will this bottle water the plants, in other words, how often do you water it? It really depends on the plants and the conditions that the plant are in. I would say, on average, about a week. Maybe just find a place near the edge of the basket to start, then dig down and towards the center of the plant so that it’s at an angle. Really clever, a simple solution! Thank you. What flowers did you use?